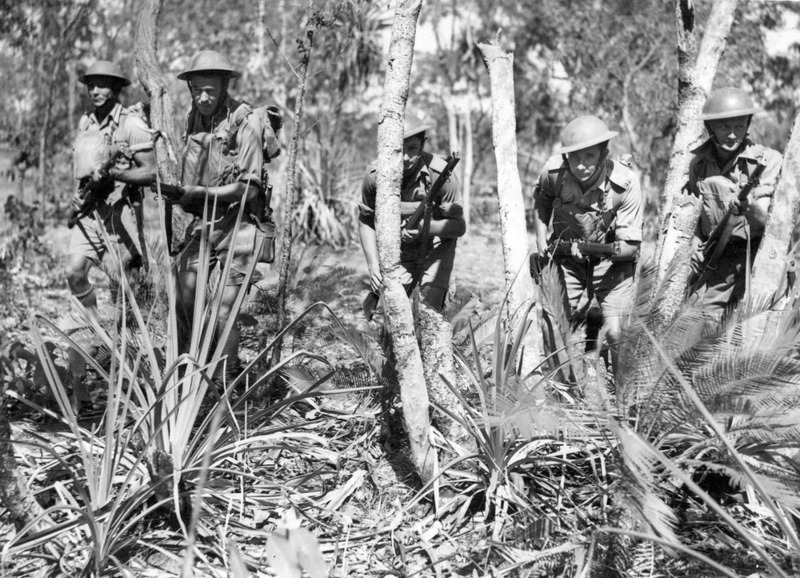 Although there are many books written on the uniforms and webbing worn by the Australian Army during the Second World War, very little of these publications focus on the forces stationed in the Northern Territory. This lack of focus may stem from a view that Australian uniforms and webbing equipment employed in the NT were rather simplistic and consisted of only a pair of shorts and a slouch hat. Despite this view, it would appear through the study of photographs and the examination of remains that the uniform and webbing equipment employed by the Australian Army in Northern Australia consisted of far more than these items alone and it is hoped that further contributions to this page will expand on this neglected area of study. 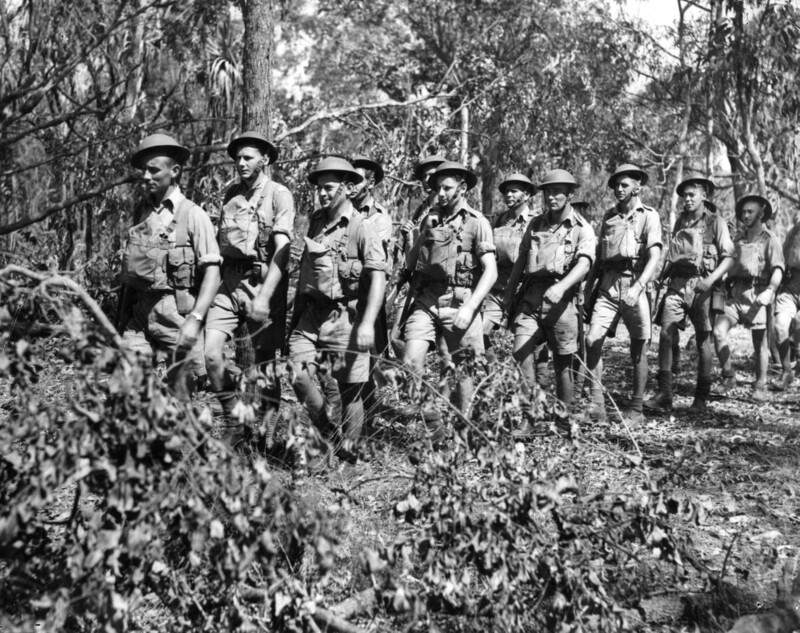 Although many of the uniforms and webbing equipment worn in the NT were employed in other theaters of operations where Australian forces were present, it is the intention of this page to detail the specific uniform and webbing combinations worn by the Australian Army, both AIF and CMF in the NT during the period 1941-1945. Analysis of photographic sources will form the basis of this study. (The term webbing is given to the fabric straps and accoutrements used to carry a soldiers equipment and supplies). 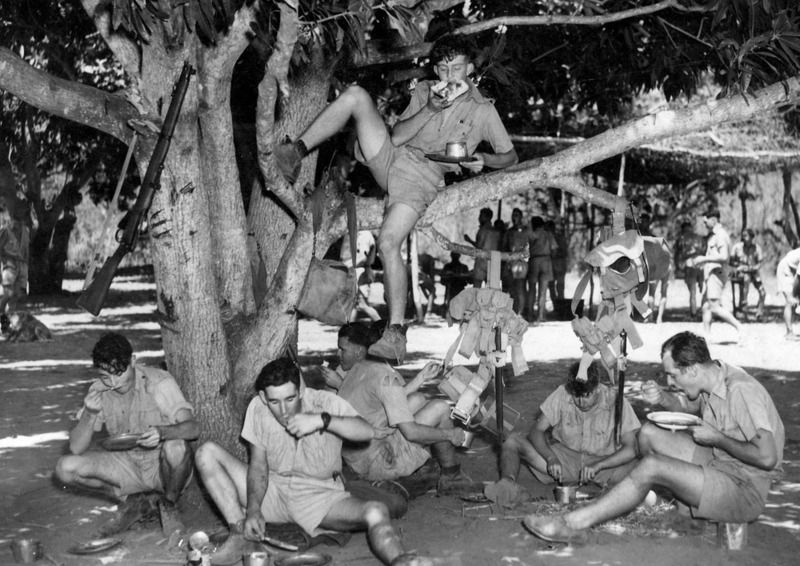 Taken in 1941, this picture shows Australian soldiers eating a meal underneath a plantation of mango trees. Hanging from the branch are two sets of webbing and does much to illustrate the webbing employed in the NT at this time as it would appear that the Australian Army relied heavily on British 1908 pattern webbing early in the war. The belt buckle, bandolier pouches and the water bottle straps pictured above clearly identify the webbing equipment above to be from the 1908 pattern. Also pictured are two SMLE 1907 Bayonets and a ww1 haversack. The webbing would have been pale green in colour. It is believed that many Australian Army units, particularly the CMF forces early in the war made heavy use of the 1908 pattern until the 1937 pattern webbing became more widely available. This photo illustrates the use of mixture of ww1 and pre-ww2 era equipment used by soliders in the NT. The soldier at left wears leather bandolier pouches around his waist dating from the the time of the Great War. The large support straps holding up his water bottle indicate that the water bottle holder is from the 1908 pattern. The soldier at right has a 1937 gas mask bag slung over his shoulder and a ww1 pattern haversack suspended on his back. All soldiers pictured here are in fact wearing gas mask bags and ‘khaki drill’ shirts. Although the actual date of this picture is not known, the webbing dates this as being from the early war period. (2nd AIF war diaries, 1939-45 War, Australian War Memorial, AWM52, 8/3/23-011). An AIF soldier in the NT during 1943 with the distinctive ‘rising sun’ badge on the brim of his hat and a MKIII SMLE slung over his shoulder. The buckle (seen above the soldiers wrist) identifies this webbing as the 1937 pattern. The belt from the 1937 pattern was considerably smaller than the 1908 pattern which clipped at the front rather than being threaded as found on the 1908 pattern. The 1937 water bottle also had smaller straps and buckles as compared with the 1908 pattern. Overall the 1937 pattern was lighter and more comfortable to wear. It is thought that as infantry units from from the 6th Division returned to Australia and were posted to the NT in 1942 they brought with them the 1937 webbing pattern equipment (although I have no evidence to support this). The 2/4 (AIF), 2/5 (AIF) and the 2/8 (AIF) for example were units that had returned from North Africa and were camped at the 67, 67.5 and 68 Mile peg. 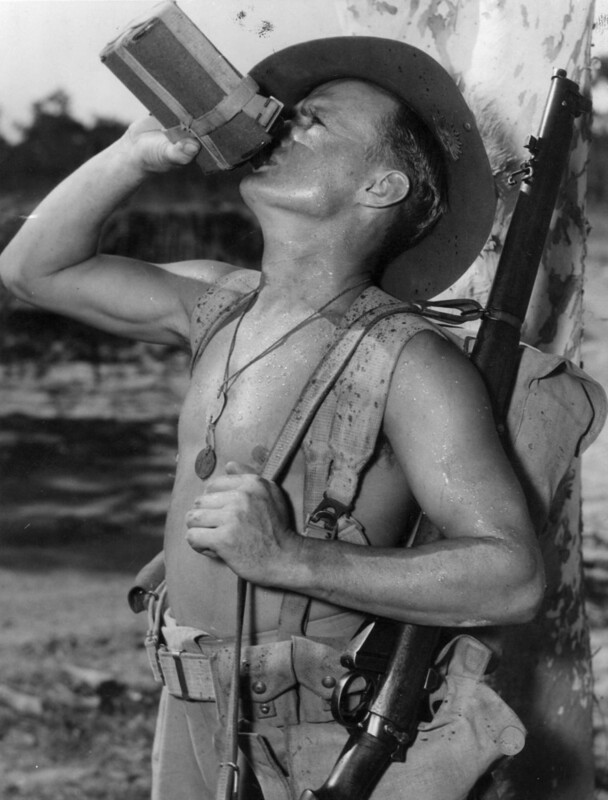 An interesting order issued from the 23rd Infantry Brigade in 1942 on the wearing of webbing in the Northern Territory’s unique climate where minimal clothing was worn by soldiers. 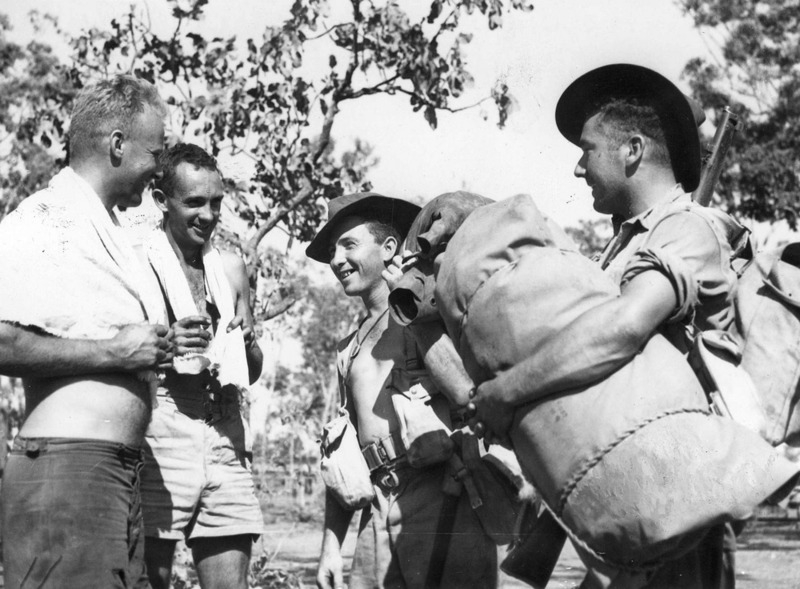 Soldiers arrive at a camp in the NT. The soldier in the center is wearing the 1937 pouch that was used to hold all manner of ammunition including Bren gun magazines. Soldiers tended to favour the 1937 pouch over bandolier pouch due to its versatility and ease of access. The soldier at right has his bed roll (swag) under his arm. 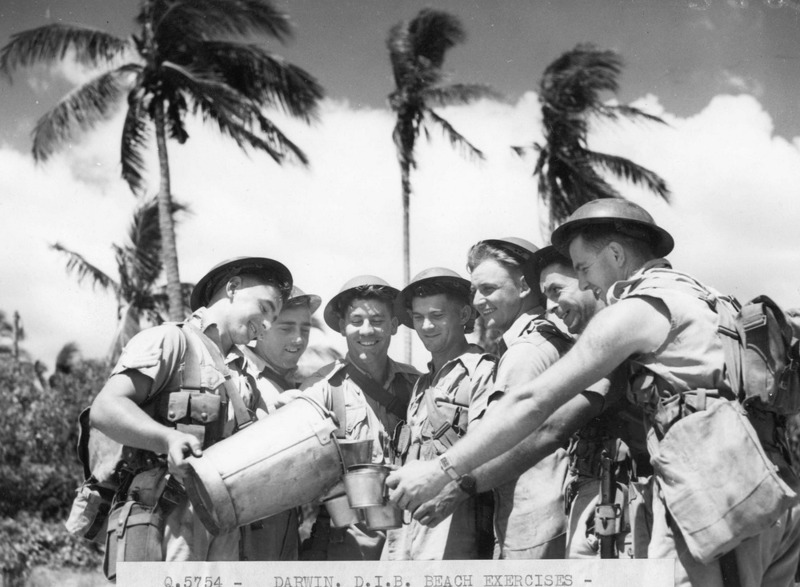 In consideration of the evidence presented in the photos above, the 1/6 figure at left illustrates a common CMF soldier in the Northern Territory in 1942 and is consistent with the photo of the soldiers on the beach. The figure is equipped with 1908 pattern webbing equipment. The belt, bandolier pouches and water bottle are of the 1908 webbing pattern. The size of the buckle and the fact that the belt had to be threaded through it is the best indication of 1908 webbing. 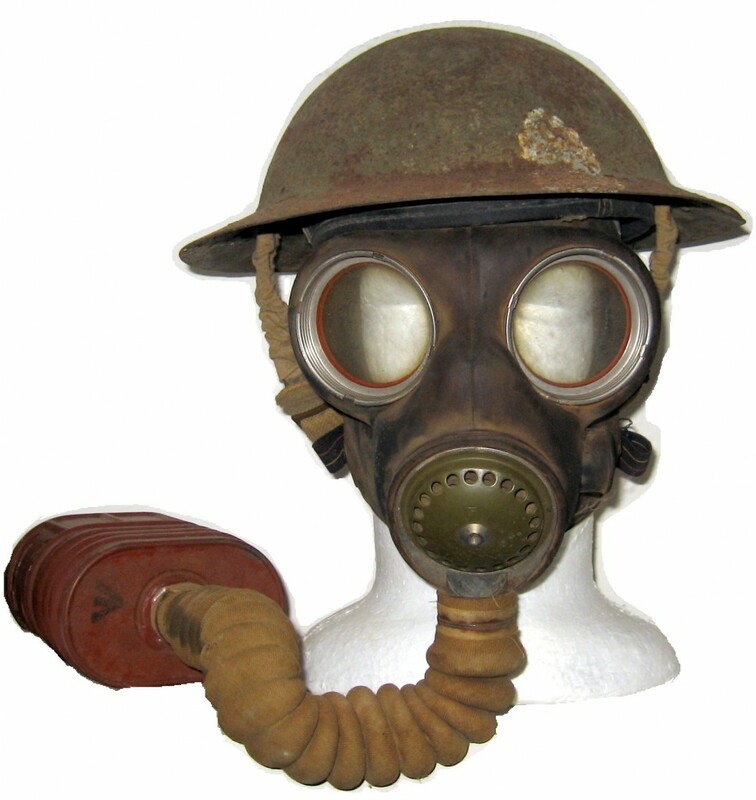 The gas mask bag is an early World War One pattern type and was normally slung under the shoulder as indicated in the photo of the soldiers on the beach. On his back he is equipped with a 1908 haversack and 1907 bayonet with scabbard. He is armed with a SMLE MKIII rifle and is wearing a slouch hat. His uniform consists of Khaki Drill shirt and shorts. Note: His boots are incorrect as they should be a leather in colour to illustrate correct Australian pattern boots. 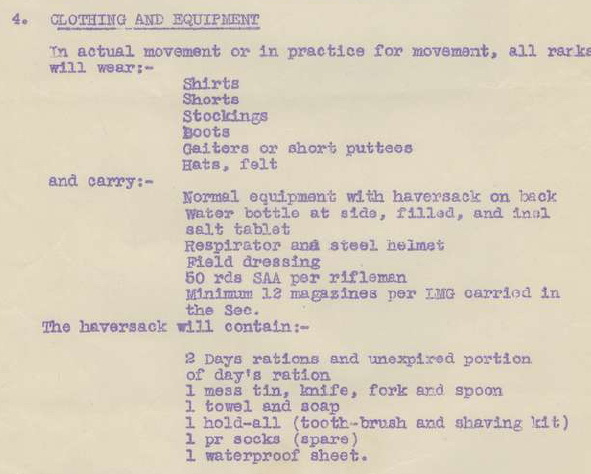 Equipment list as specified in 1942 for the Australian infantry soldier in the Northern Territory in 1942. 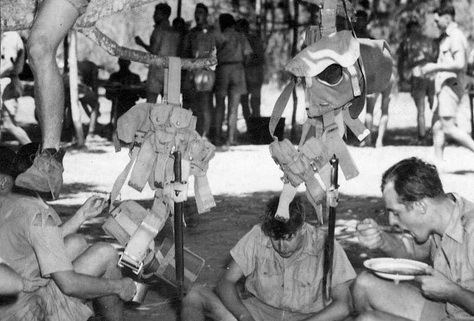 Darwin Fortress soldiers equipped with 1908 webbing equipment with 1938 gas mask bags at the ‘emergency position’. 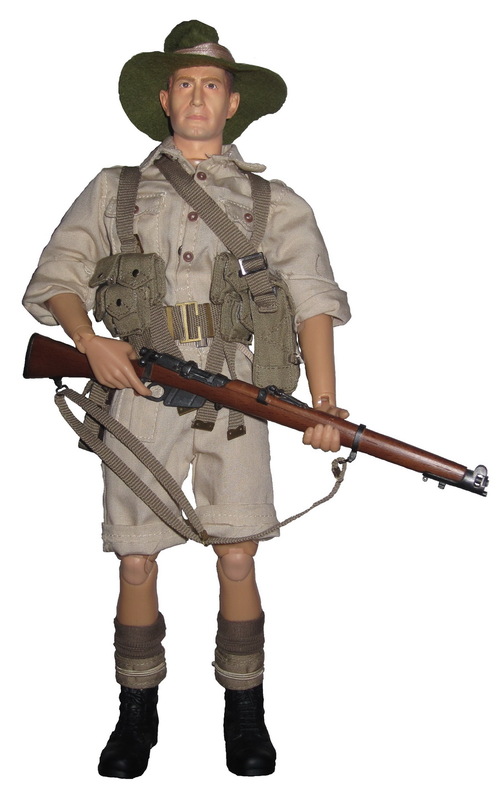 This figure represents a typical AIF Sergeant stationed in the Northern Territory in 1943. His webbing consists of the 1937 pattern and can be distinguished by the belt and the two ammunition pouches indicative of the 37 type equipment. Note also the smaller straps of this type of webbing used to attached the canteen. 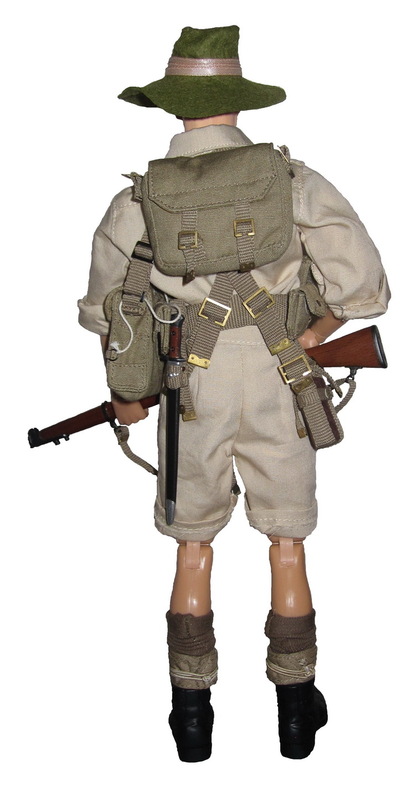 Over his shoulder he is carrying a Bren Gun of which AIF units were equipped in late 1942. 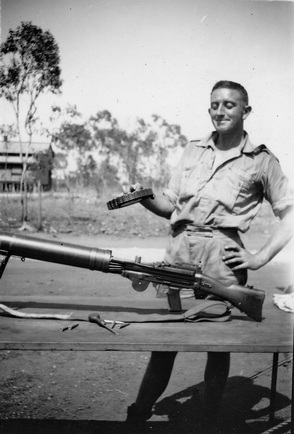 It proved to be much more suited to the NT than the Lewis Gun that was employed by AIF and CMF units previously. Note: Boots are incorrect. Below: The order to replace the Lewis Machine Gun with the Bren Gun. A soldier in the Fortress area cleaning a Lewis Machine gun which preceded the introduction of the Bren Gun in September 1942. Most CMF Battalions were equipped with Lewis Guns before they were replaced by the lighter and easier to service Bren Guns.